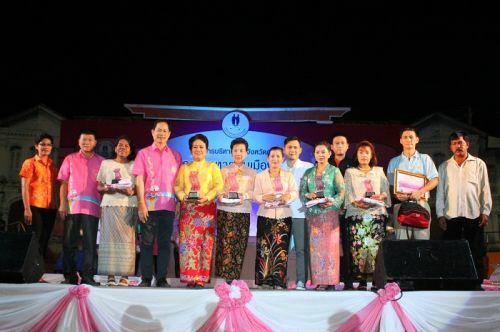 PPAO Council Chairman Theera Jiasakul on January 24 awarded prizes to winners of khao yam (rice salad) cooking contest and to owners of the most hygienic food stalls at the seventh Phuket Local Food Festival organized by PPAO in Sapan Hin main stage. Mr Theera was accompanied by Council Member Prasit Sinsaowapak. Slogan at the Phuket Local Food Festival was “delicious without alcohol.” Winners of khao yam cooking contest were: Nongnapas Sematrakul (winner); Chaba Ritnoom (first runner-up), and Sirinat Keonui (second runner-up). All received a plaque each and prize money of 5,000, 3,000 and 2,000 baht respectively. Winners of hygienic stalls were: Kukwan (winner); Khao Yam Baipahom Phuket (first runner-up); and Nitaya Sarapat Tod (third runner-up). The judging of hygienic stalls was based on the types of utensils used, and whether staff wore caps and traditional dresses. Additionally, prizes were given to the winner of local food photography contest, Chusak Uthaipanumas. This project was given support by Cannon. Furthermore, stalls inside the festivals have collected a donation of 64,500 baht towards the treatment welfare fund of PPAO Hospital. An earning of 6,554 baht of a small school band from PPAO Ban Mai Riap School was also added to this donation.